Slavic and Germanic grammars: A Comparative view. 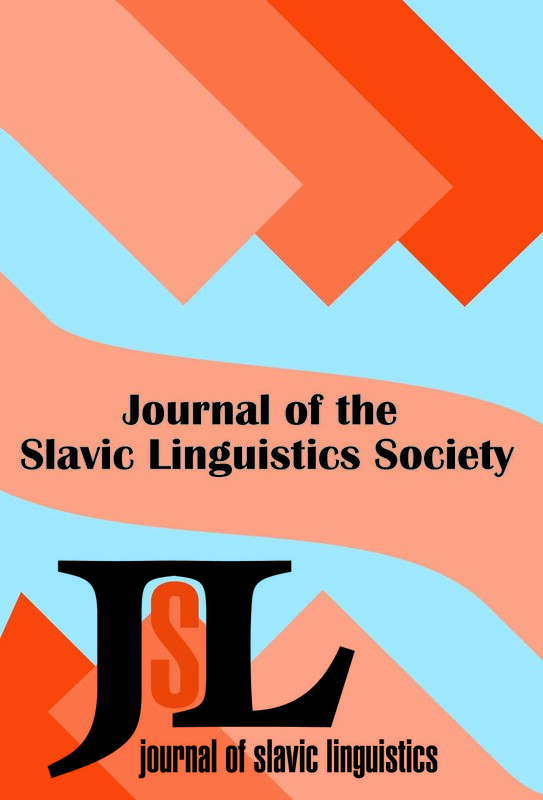 Abstract: This paper addresses grammaticalization of the preterit and future auxiliary clitics derived from the verbs ‘to be’ and ‘to take’ in Southwest Ukrainian in comparison with North and Southeast Ukrainian, and the adja¬cent western and eastern Slavic dialects. It posits a parallel grammaticaliza¬tion of such auxiliaries in the aspect of retrospection (preterit) and the aspect of prospection (future), although with different results in various Ukrainian dialects. Unlike the Polish auxiliaries that turned into person-number markers, the preterit auxiliary clitics are not fully degrammaticalized in Southwest Ukrainian and are altogether absent from North and Southeast Ukrainian. The auxiliary clitics used in the de-inceptive future derived from the periphrastic formation with the auxiliary ‘to take’ were undergoing grammaticalization along the clitic continuum postulated in the paper for the Ukrainian-speaking territories. The term ‘synthetic future‘ in Modern Ukrainian for formations like čytatymu ‘I will read’ is misleading, since the grammaticalization of the auxiliary did not run to completion. This explains its loose integration with the infinitive and the de-inceptive interpretation of the synthetic future ‘I will [begin] to read’ as compared to the analytic future formation ja budu čytaty ‘I will read’ in all the major Ukrainian dialects. Abstract: The present study examines how foreground and background is marked in L1 Russian and L1 German, to test the hypothesis that L1 speakers of Russian writing in German as L2 will use tense-switching to differentiate foreground and background. Results suggest that Russian-speaking writers used grammatical aspect while German-speaking writers employed inherent properties of the verbal predicate to mark foreground and background. The L2 data revealed a more mixed pattern: one third of the Russian-speaking L2 speakers of German used L1 Russian pattern, switching between different tenses to mark foreground and background; another third of the Russian-speaking L2 users of German were comparable to L1 German speakers; and a third group of the Russian-speaking L2 users of German wrote their texts in the present tense. These results indicate that switching between foreground and background, as a critical property of proficient narrative discourse, con-stitutes a long-lasting challenge in learning a second language. Abstract: This paper has two aims. The first is to describe a pilot instrumental study of the incomplete neutralization of Russian final dental stops /t/ and /d/. This study refutes the results of a previous instrumental study of word-final voicing neutralization, which suggested that /t/ and /d/ are completely neu-tralized word-finally. The study examines several phonetic quantities that might be correlated with incomplete neutralization and serve as cues for the correct classification of voiced and voiceless obstruents. The second aim is to bring forward an extensive summary and discussion of previous studies and theories on incomplete neutralization.